... 1986 (25 years ago today), the 1975 Nobel Peace laureate and "most prominent Soviet dissident, Andrei Sakharov ... arrived with his wife and co-activist Yelena Bonner to a crowd of journalists and the public gathered at Moscow's railway station." Their arrival put an end to nearly 7 years of forced internal exile in the "closed city" then known as Gorky; today, Nizhny Novgorod. Criticism of Soviet intervention in Afghanistan had prompted the banishment. 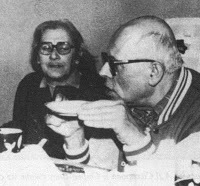 (credit for 1986 photo of the couple) As we've posted, Sakharov, who died in 1989, and Bonner, who died this past June, both continued to campaign for human rights for the rest of their lives.